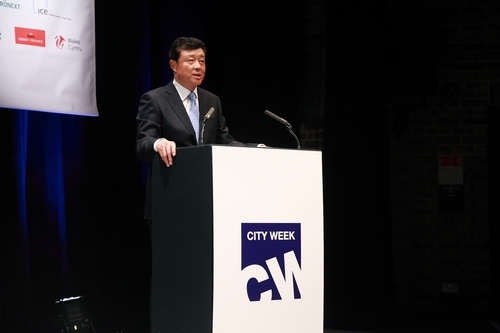 It is an honor for me to once again speak at the annual event of City Week. 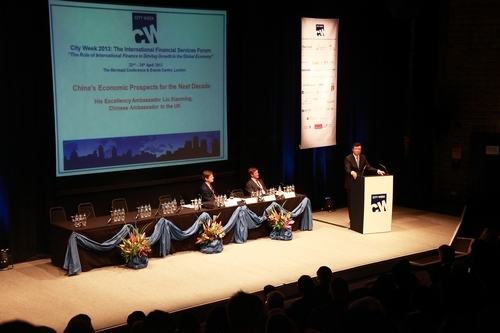 The focus of my speech today is China's economic prospects for the next decade. This is a hot topic for political leaders, diplomats, business community and media. Some feel optimistic. Others are pessimistic. Some predicted its continued growth. Others believe it will slowdown. There are even some wild predictions. I would summarize China's economic prospects in three words. That is: Growth, growth, growth. I am not simply copycatting the golden rule of the property market 'Location, location, location'. I will explain to you why I repeat the word growth three times, because there are three dimensions of China's economic growth. First, a growth with change of model. In the past more than three decades, China's economic growth was mainly driven by investment and export. But, both investment and export driven growth had obvious drawbacks. For example, investment was only an input in production factors. It incurred high consumption of energy and resources. Indiscriminate investment also caused excess production capacity. The complication of this export driven model is China's over dependence on external markets. External markets will always become saturated. Moreover they have many uncertainties. In particular this is the case since the onset of the international financial crisis. The export driven growth strategy means that China has been acutely susceptible to other economies and global economic cycles. A main target of the Chinese economy is to double China's GDP by 2020 - compared with 2010. · And, secondly adjust economic structure. Over the past three decades you could describe the Chinese economy as riding on two wheels. These two wheels are investment and export. China must now add two more wheels and create a new balanced momentum that rides on four wheels. The additional two wheels must be consumption and scientific innovation. The analogy can be further developed. A four-wheeled vehicle will always be faster and steadier than a two-wheeled one. · Investment and export are slowing down. · But consumption is growing at a double-digit rate. · A modern service sector is burgeoning. · New growth areas for consumption are emerging. · China's capacity in scientific innovation is strengthening. · Some traditional industries have revived through technological upgrading. · Across the world, China ranks 4th in patent application. · China's economic growth is shifting its focus from size to quality. As China shifts to run on the four wheels of investment, exports, consumption and scientific innovation there will be a crucial change in the annual growth rate of China. That annual growth rate will be lower and it is very important that observers of China understand that this is a positive development. As the new growth strategy kicks in, China's economy will no longer maintain a double-digit annual growth rate. The lower rate of 7% to 8% will indicate that the Chinese economy has become more healthy and more sustainable. To transform its growth model China will need to undertake other changes. For example, China will have to remove institutional and policy barriers throttling the economy. This means we need reform. Premier Li Keqing has stressed on many occasions that reform brings China the biggest dividend. It is fair to say that we are now witnessing in China the best ever interactions between the top-down design of reform and the implementation on the ground. · The Ministry of Railways has been disbanded. · Food and drug authorities have been merged. · A unified department has been established to manage maritime affairs. This ended up previous chaotic situation where maritime affairs were administered by nine separate departments. · Preliminary reform measures on income distribution have been drawn up. · Chinese new leaders have taken the lead in banning pomp and empty speeches. · Chinese new leaders have publicly opposed luxury and ostentation. · Chinese new leaders have made themselves an example of frugality, service and integrity. All these show that a new round of reform in China is well under way. Undoubtedly this commitment to reform will be a powerful driver of China's future economic growth. Now I come to the second dimension of China's growth. It means balanced and coordinated growth. The four 'modernisations' were a primary objective of China in its early days of reform and opening up. It was also the relentless pursuit of a whole generation. 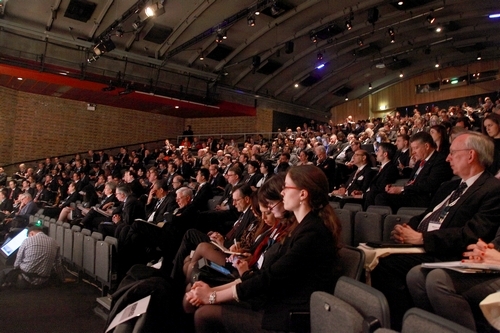 · China will still have a focus on continuing industrialisation. · China will still concentrate on the modernisation of agriculture. · But, China will now push forward urbanisation. · In addition China will press ahead with the latest developments in information technology. Overall China will make synchronised and integrated progress of these four goals. China's current urbanisation rate has passed 50%. However, China still has a long way to go before reaching comparable rates of urbanisation in the high income countries. The average level of urbanisation is 80% in developed countries. More importantly, the quality of Chinese urban areas is barely satisfactory. Newly urbanised people in China are yet to enjoy the full benefits of city dwellers. · It will help specialized division of labor. · It will create economies of scale. · It will boost productivity. · It will help move surplus rural labour into cities. · It will turn much more of China's agricultural population into urban citizens. · It will provide all people equal access to rights, opportunities, rules and public services. · This in turn will bring more opportunities for all. · Most important it will improve quality of life for all. If China is to remain as an important engine for world economic growth, it's crucial that it stay at the front line of scientific and technological revolution. China was a late starter in industrialisation. But China's gap with developed countries in information technology is not so huge. The combination of industrialisation and information technology can provide immense economic drivers. These two forces can jump start industrial upgrading. They can bring about a 'sea change' in the traditional process of economic cycles, production and consumption. Likewise the combination of urbanisation and information technology will also create profound change. It can greatly facilitate urban management and make cities smart. The result will be dramatic improvements in the quality of life of all city dwellers. The balanced and coordinated advancement of the new four goals is of great importance for China. This will be a major contribution towards the transformation and upgrading of the Chinese economy. Turning now to the third dimension of China's future economic growth. This is the growth of 'happiness index' of the Chinese people. A moment ago, Mayor Johnson talked about his dream for London. Late last year, General Secretary Xi Jinping put forward the concept of the 'Chinese Dream'. He stressed that in the final analysis the 'Chinese Dream' is the dream of the Chinese people. An important part of the 'Chinese Dream' is the happiness of the people. In growing the Chinese economy, we aim to let the people enjoy the growth benefits and make all Chinese people happy. In real terms, economic growth should increase people's incomes. · By 2020, we will double both GDP and people's income on the basis of 2010 level. · This means GDP and incomes should increase at the same pace. "We need to not only build up bones but also put flesh on them." To this end, China will reform and standardise income distribution and narrow the income gap. Only when all people have a 'fat purse', can China stimulate domestic demand and spending. In turn, the economy will achieve sustained growth. Growth underpinned by environmentally sustainable policies is a core part of government strategy. Recent air condition in Beijing has made headlines around the world. The heavy fog in Beijing exposed people to the enormous environmental cost of economic growth. Without clean air and water, economic growth will greatly depreciate. To achieve growth at the sacrifice of the environment is definitely not China's choice for the future. I have noticed that both Chinese and foreign media often compare Beijing's miserable air quality to the Great Smog of London in 1952. Now the smog in London is a thing of the past. What about China? China is making the world's largest ever green investment. The most promising sector in China's stock market is environmental protection. For all these factors, we have every reason to be optimistic. China believes that after treatment Beijing will also bid farewell to smog and the blue sky will return. So, economic growth and a 'beautiful China' are mutually enhancing. Of course China's economic development will not be plain sailing. Only two days ago, an earthquake measuring 7.0 on the Richter scale hit China's Sichuan province, causing huge loss of lives and property. The international community, including the British government and people, has offered condolences to the Chinese government and people in the disaster stricken area. We are deeply moved and grateful for your compassion. I want to assure you that the Chinese government and people have the confidence and the ability to carry out disaster relief and rebuild the homeland. In conclusion, I want to end with an optimistic note that in the coming ten years China's economic prospects will be ever bright.